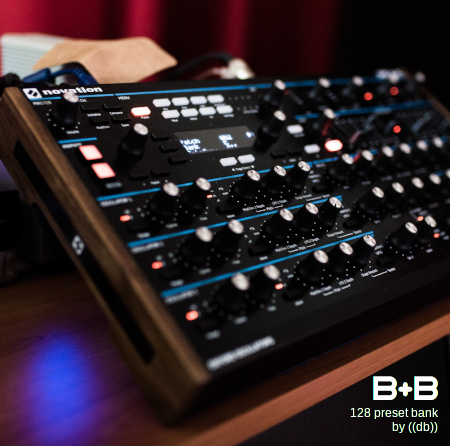 B+B patches for Novation Peak is our higly creative, musical and inspiring top class preset / patch bank for the ground breaking new PEAK synthesizer from Novation. B+B digs out the sonic specialities of the Peak - for brave producers and bold artists. our "bread and butter" patch bank - contains 128+ full original presets with over 200+ sounds (by animate switches) for the revolutionary new PEAK analog / hybrid synthesizer from Novation. It "completes" and extend the factory patch collection with "bread" - anything needed for writing complete tracks and with a lot of "butter" - inspiringly fresh sounding patches / sounds for creative modern music styles. all B+B presets are originally designed and programmed by Niels Dettenbach (dettenbach audio) from init in over 6 monthes of intensive, professional sound design work. this patch collection mainly targets studio and live artists of modern music genres - with a taste of neuro and psychoacoustical engineering - the "butter". to round up, as further "bread" a base set of sounds as drum / perc kits and a few adopted classic electro sounds with the significant "spice" and the fresh punch / dynamics of PEAKs new arch - for easy tuning and custom tweaking - is included. B+B strongly focus onto the dimensions of fresh and new sounds the groundbreaking new FPGA-driven architecture and the revolutionary (high speed) "Oxford Oscillators" of the PEAK to open them to modern artists playing (and producers working) on modern - or even new - music styles. the primary target was to provide modern analog sounds that are sounding really new, fresh and crisp while still beeing musical / playable and as such usable as your fresh "bread and butter" in your studio and live - from pushing pop, hiphop over edm, electro to harder electro and neuro - up to experimental. while these sounds are all usable out of the box within modern musical projects - they offer starting points into dimensions of new sound fields easy to explore - to the professional studio producer as creative live musicians - who are looking for a really fresh sound flavour and not just another adaption of often heared synth sounds on "just a new synth" platform. the zip archive (of the full version) contains a full patch / preset bank file with synthesizer 128 presets and a folder with all of the patches in single files for individual usage. the presets only works with the NOVATION PEAK SYNTHESIZER. for flexible usage each single preset file has one or two 3-char postfixes, representing the type of the sound. the pack contains the following types. many presets (or variants) fit into more then one category. these list shows only the main type (as saved in the PEAK). for more details, see the list of patches (PDF, 37KB). a free license of the B+B Drums + Perc sample pack / Ableton drum rack is included. most presets still come with multiple modulation pathes (animation buttons, modwheel, aftertouch...). the sounds of the most arp presets could be used standalone too (by just pressing / disabling "arp"). many sounds have matching arp settings preconfigured. All patches are equipped with programmed FX. Many sounds could be used without PEAK fx too (by just switching "Effects" > "bypass") if you prefer to use your own external or DAW fx chain in your application. the installation could be done very easily by the official PEAK librarian from Novation as with any other standard SYSEX tool into any of PEAKs preset banks. You can load single sound files into any preset memory location too. feel free to link to this page or site if you want to spread it from other websites. feel free to contact me in any case of questions, ideas, complains or whatever you want to say. the whole package as any sounds are compiled for easy usage. however, if you face to any further questions or problems, feel free to ask me (Niels) in any case directly (see bottom). please make shure you have the latest frree update of this product in usage. Niels Dettenbach is the founder and owner of dettenbach audio - a company which produces sounds, music and music software tools. this is a demo of a public released song which consists only of sounds from the B+B patch bank - mixed and mastered for release. for maximum transparency, this demo track is produced with around 30 of the unmodified / original sounds from the B+B patch bank only, raw track by track recorded with just slight sum limiting and sum eq. pls use proper equipment for playback. this is from a "early stage" of the public released "From Zero" track.